" Around 11:00 o'clock this morning, local time, the United Nations House in the Nigerian capital, Abuja, was struck by a car bomb. These buildings house 26 humanitarian and development agencies of the United Nations family. This was an assault on those who devote their lives to helping others. We condemn this terrible act, utterly. We do not yet have precise casualty figures but they are likely to be considerable. A number of people are dead; many more are wounded. Nigerian and international search and rescue teams have mobilized and are moving the wounded to hospitals and providing emergency aid. I am asking the Deputy UN Secretary-General, Ms. Asha-Rose Migiro, [to go] to Nigeria immediately and am mobilizing the UN system to respond to this emergency. She will be accompanied by the UN security chief, Under-Secretary-General Gregory Starr, and meet with Nigerian authorities upon arrival in Abuja. I am going to call President [Goodluck] Jonathan of Nigeria soon. On this very sad occasion, I extend my deepest sympathies to the victims and their families. 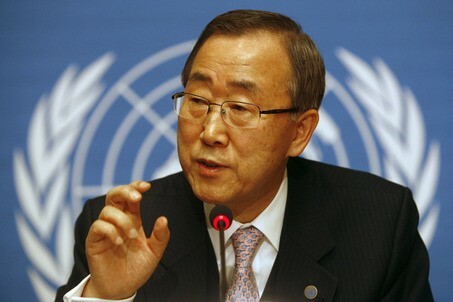 The United Nations will undertake every possible effort to assist them during this difficult time."